Disney just released some of the concept art and in-depth details for the Cars Land Halloween overlay on their blog. See here for the link. It definitely seems to me like they aren't afraid of spending money (especially given the new songs for the rides), but I'm expecting RSR to get an overlay too in the coming years just so Disneyland doesn't continue its monopoly on the seasonal overlays. I'm not sure it will help the crowds much, but hey, worth a shot. Another very good (Step-by-Step) video from Yensid 55 documenting the construction progress on SWGE for the month of August 2017. Mark and his daughter Megan always do a good job on these videos. Mark seems to have a bit of construction knowledge and I really enjoy the way he uses dissolves to to show progress from week to week and how what is being constructed now will eventually look when all the work has been completed. 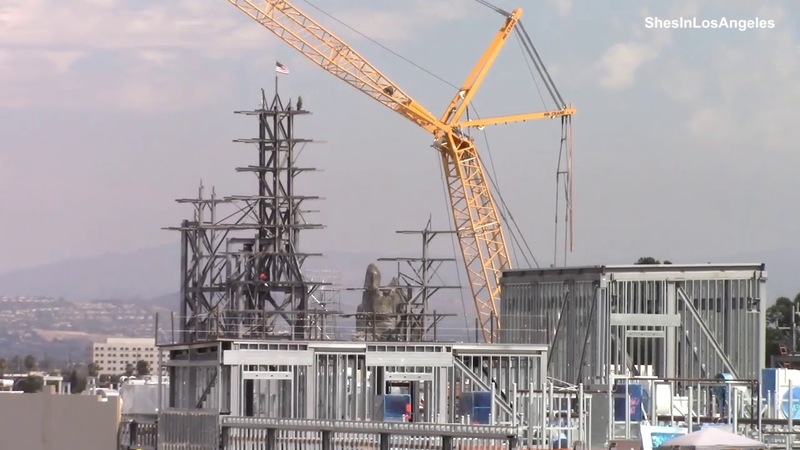 This video shows the development of Star Wars Land (aka - Star Wars: Galaxy's Edge) during August 2017. Last edited by Hammer; 09-05-2017, 05:44 AM. Although, it's a little depressing seeing signatures so far out on the horizontal beams of the topped off structure. Those beams are going to be used to hold scaffolding up while rock work is created. Then, they'll be cut off. Two new SILA videos from yesterday 9/5/17. SWGE construction view from Big Thunder Trail. They're installing the steel wire and mesh rock work tiles on the steel support structure on the MF building. Very cool to see it all coming together! SWGE construction from Disneyland Dr. and the M&F parking structure. 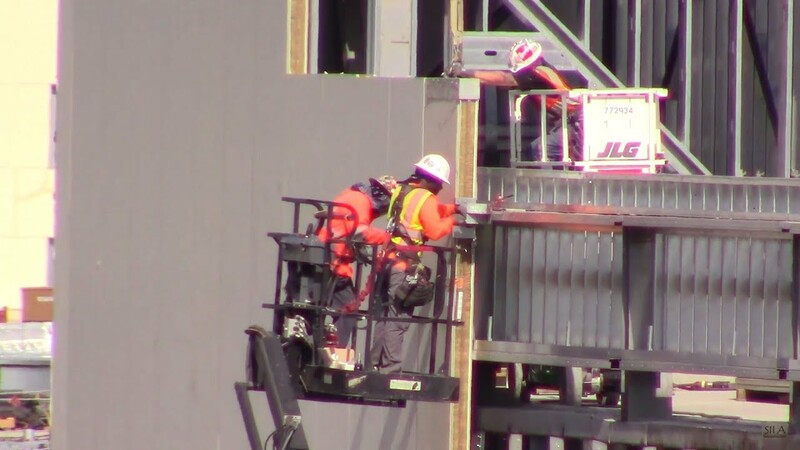 The exterior finish material is now being installed on the northern side of the BE building, unfortunately this is the beginning of the end for our viewing the inside construction on the attraction. 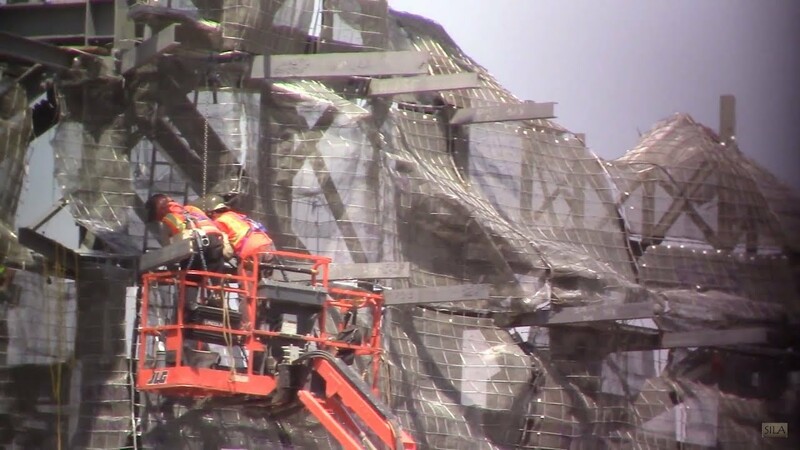 The large curved structure at the end of the video in the BE Building will probably be a LARGE projection screen. Last edited by DLFan1995; 09-13-2017, 01:19 PM. Last edited by DrAlice; 09-08-2017, 07:09 PM. Just re-watched the video after reading this and if you pause at 14:27 you'll see that there are no signatures on the horizontal beams. Those are markings for the rockwork to tell them which ones to hang. You can see K37, K33, K31, etc. No signatures will be lost. Thanks for checking that. Also, Yensid confirmed that on a YouTube comment. Apparently, the cross beams (for scaffolding) were not even attached when the signings took place. Three new SILA videos from yesterday 9/12/17. SWGE construction from Big Thunder Trail. They're making great progress installing the steel wire and mesh rock work tiles. 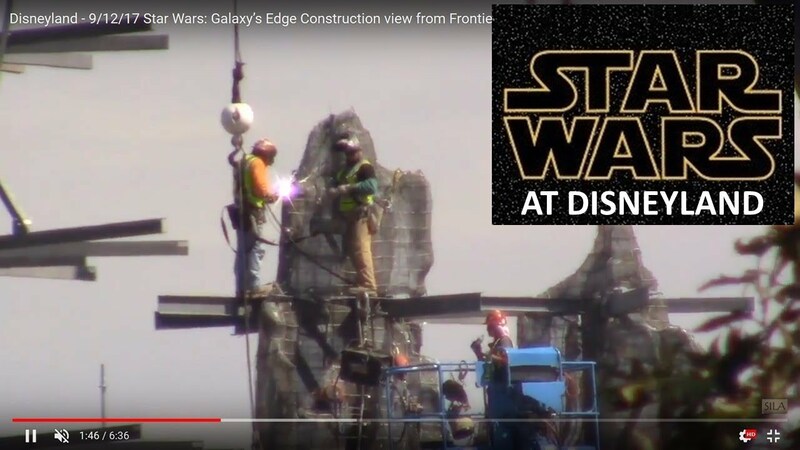 SWGE construction view from inside Disneyland. At 9:30 looking at a couple of panels inside the BE building. One has "Disney use only" written on it and the other looks to have some documents posted on it. At 9:22>, it appears that they are leaving this large opening in order to facilitate the loading of props & set pieces. That will allow continued visual access for comments when they are being installed. 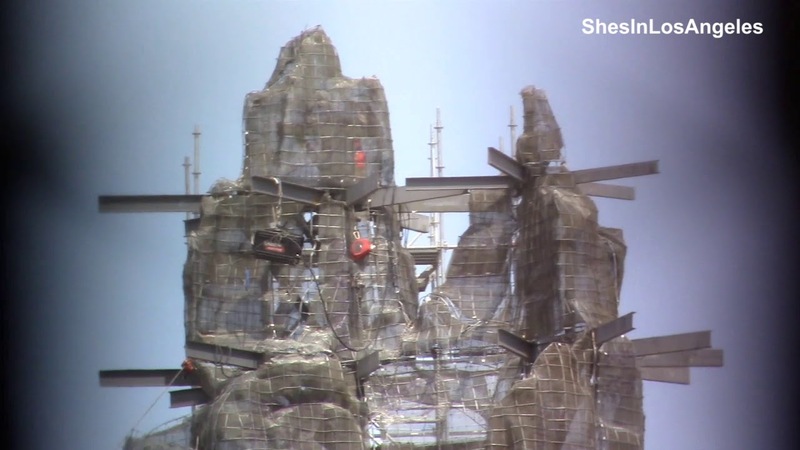 Another SILA video from 9/12/17, this is a view of the SWGE rock work construction from Toontown. 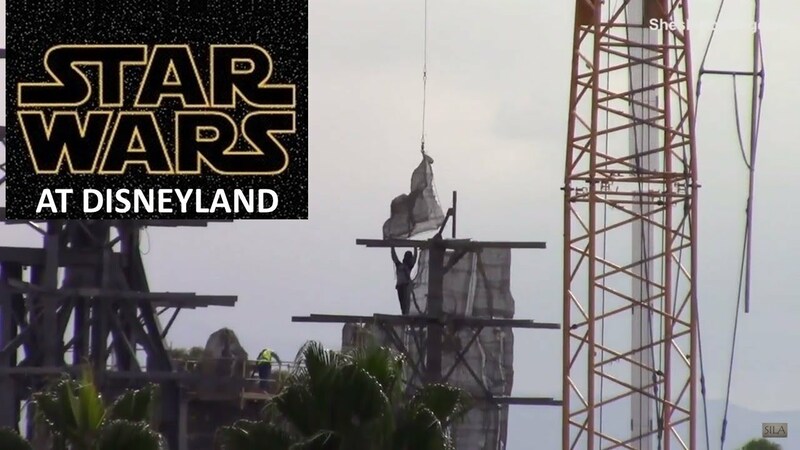 It looks as though they have some adjacent scaffolding set up on top of the MF building. Yet another SILA video from 9/12/17, this is a view of SWGE construction from the Mark Twain. It's mostly Rivers of America but there are some good views looking back from the stern of steel structure for rock work going up on and around the BE building. The rock work is strong with this one. Two SILA videos from Wednesday 9/20/17. SWGE construction from M&F parking structure and Disneyland Dr. They're moving along with the instillation of the exterior panels on the BE building, they probably want to get it enclosed before we get into the rainy season. 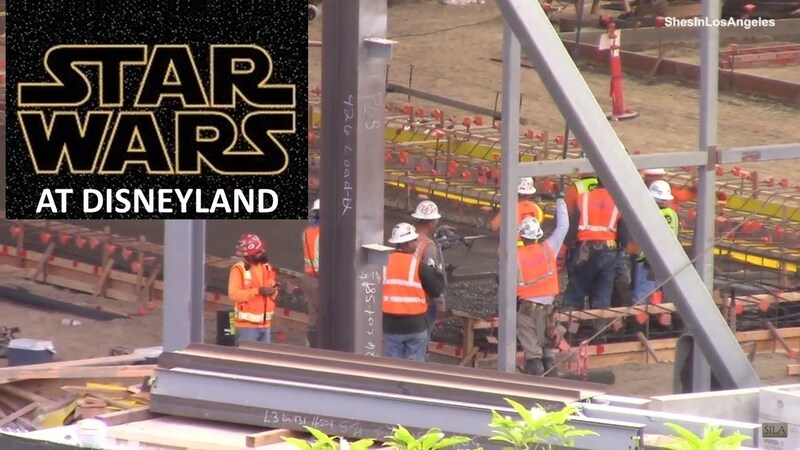 At 2:20, inside the Launch Bay they've formed and poured some concrete and a lot more formwork is being built in there. 12:55 it looks like there is some kind of light inside the BE building, can't tell if it's a light fixture or a construction construction light. 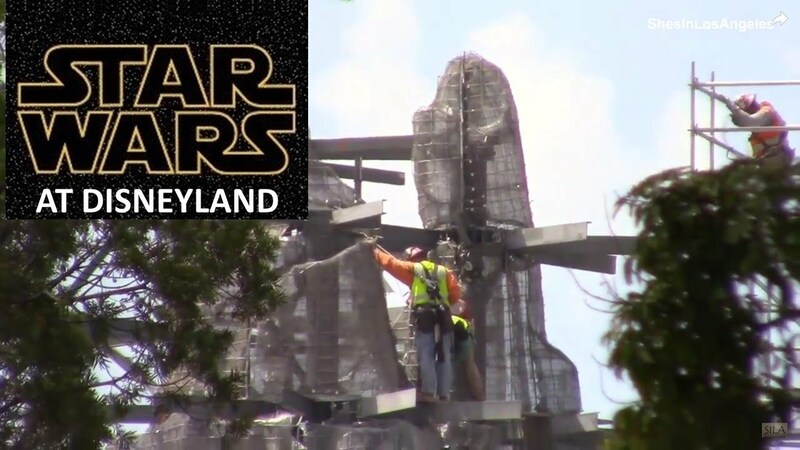 A video of them lowering one of the rock work tiles toward the top on one of the tall rock formations into place and having quite a bit of difficulty in the process. Nothing like hanging out, dancing with a large chunk of steel wire and mesh, about 100 feet in the air. A new SILA update of SWGE construction from yesterday 9/27/17. At 2:10 from the M&F parking structure a new bit of steel structure for rock work has been installed toward the front (south side) of the BE building. 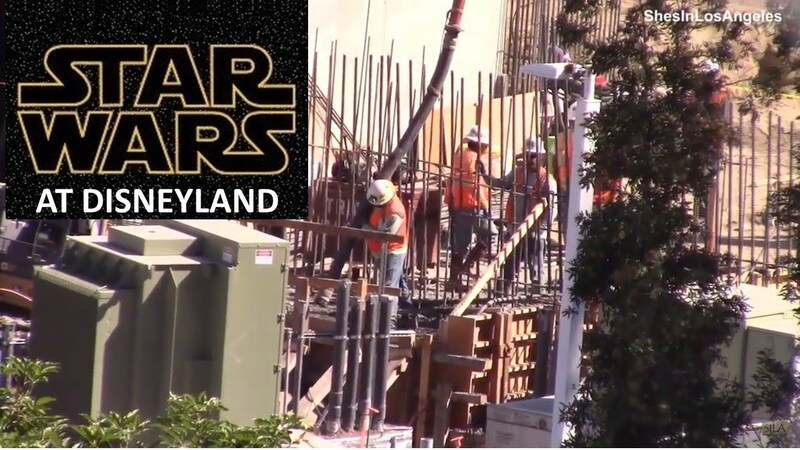 3:20, there's a flurry of activity in the Launch Bay area, they're very busy building forms, pouring concrete and laying conduit for infrastructure. 11:00, they're pouring concrete into footings that have a lot of vertical rebar, obviously more structure will be going up there. 11:45, the steel wire and mesh for the rock work had been completely installed on one of the tall rock formations on the MF building. Scaffold planks and railing have also been installed so we should see some base material for the rock being applied soon. 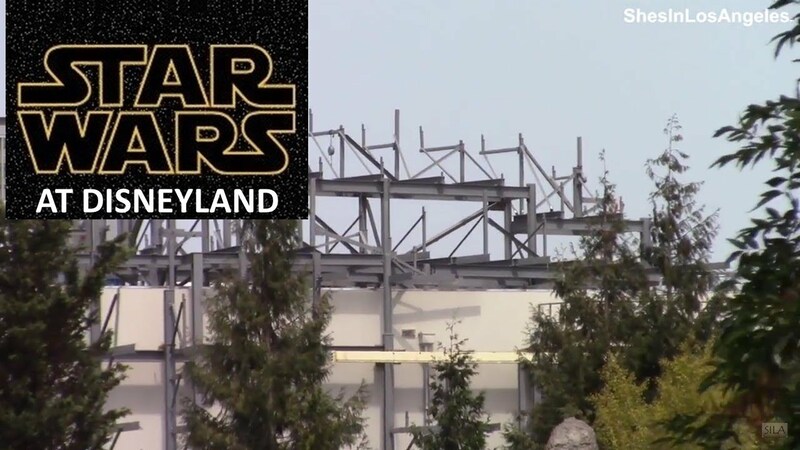 I find it amazing, that this time last year, the buildings were still pits, the acesss road was still there, and they were building the border for Galaxy Edge and Frontierland.